have you got any new amiibos today richarduk. Not many places have the Yoshi one, the only place I've seen it in is Game and Argos, don't know why though. didn't get any new amiibos today. are you getting any new amiibos this week. didn't get any new Amiibos this week. won't be getting any new Amiibos this week. won't be getting any Amiibos this month. I've lost my enthusiasm for amiibo. I like the concept and, in my eyes, the figures have improved in build quality since they were originally launched, but the sticking point is how they're used. I want to see the figures capable of Skylanders-type interactivity i.e. plonk the figure on the base and you can then play as that character in-game, collecting stuff and powering-up. amiibo seem to be used as unlock tokens in most cases; they don't offer the same kind of fun or development. It hasn't helped that some figures have been so hard to purchase. I would have grabbed a couple of the latest Zelda and Bayonetta amiibo were they not so difficult to find! ...and he's massive! Double the standard amiibo size . Awesome may get detective pikachu amiibo this year. i'm getting Detective Pikachu march also may get amiibo too. 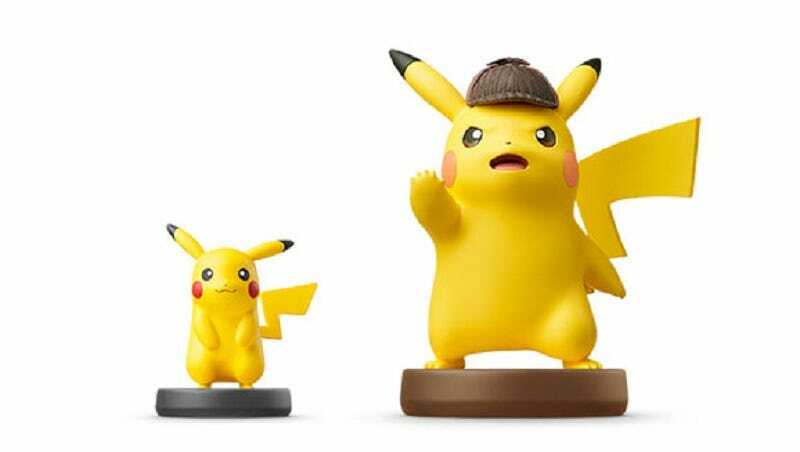 I wonder why they have made the Detective Pikachu amiibo so much bigger? won't be getting amiibos next week. Won't be getting toys any time soon. may get amiibos next week.